This infor­ma­tion is from 2012 and is out-of-date. I’ll even­tu­ally update it and archive the old info for pos­ter­ity, but in the mean­time, here it is. If you want to know when I update this page, why not sign up for the newslet­ter? Here’s my full kit. 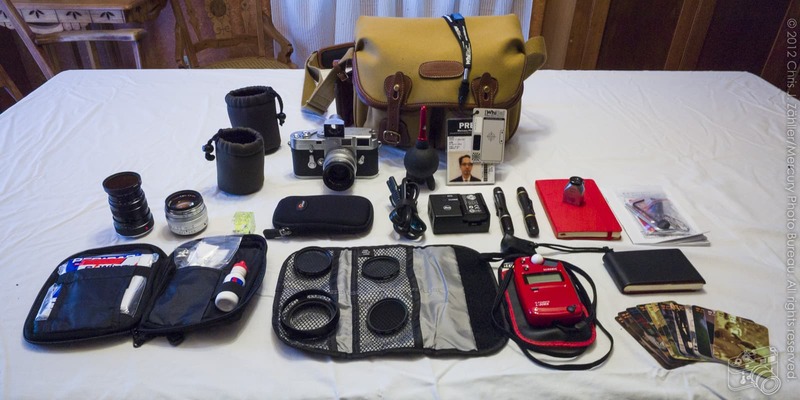 Everything fits in the bag, except the tri­pod + head and the Leica M9-P with a lens, usu­ally the 50mm, attached, which I wear across 1 shoul­der, along with the WhiBal card and a press ID. The fol­low­ing items aren’t shown because I used them to take the fea­tured image, duh. You can see the tri­pod and head in my review. Also not shown are var­i­ous lens & body caps and a cou­ple of lenses I don’t carry with me: a Leica Hektor 135mm f/4.5 and a Leica Summaron 35mm f/3.5.